‘Problem-Wisdom: Thai Art in the 1990s’ showcases the Gallery’s holdings from a key moment in the development of contemporary art in Thailand. The exhibition represents artists’ responses to the uncertain social and political context of a nation in transition, as well revealing the continued importance of Buddhism in both art and life in Thailand. Thailand is the only South-East Asian country never to have been colonised, and it also avoided the devastating conflicts that have so affected its neighbours. 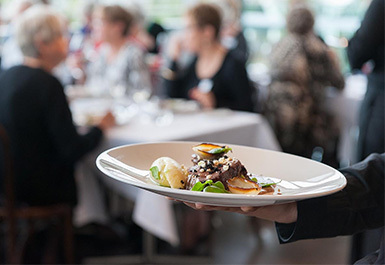 Instead, the country experienced substantial population growth through the late twentieth century – along with a thriving tourism industry – and became one of the region’s largest economies. Since the 1970s, however, ongoing tensions between the monarchy, military and civilian rule have fostered periods of public unrest, at times resulting in violent confrontations. Simultaneously, artists were experimenting with new materials, platforms for public interaction, and exploring the role of Buddhism in new art forms. Each of these issues had a noticeable influence on the art being produced in Thailand during the 1990s. Taking its title from Kamin Lertchaiprasert’s 1993–95 installation, ‘Problem-Wisdom’ focuses on two artistic approaches that shaped Thai art during this period: responses to political instability and social issues; and the relationship between the country’s contemporary art, spirituality and traditions. The exhibition features significant works by some of Thailand's most influential artists, including Montien Boonma, whose work investigates Buddhist and meditative principles; and Vasan Sitthiket, known for making bold statements on politics and social morality. Araya Rasdjarmrearnsook and Pinaree Sanpitak – two of the few female Thai artists to attract international attention in the 1990s – provide poignant reflections on the representation of the female body in a largely patriarchal society. 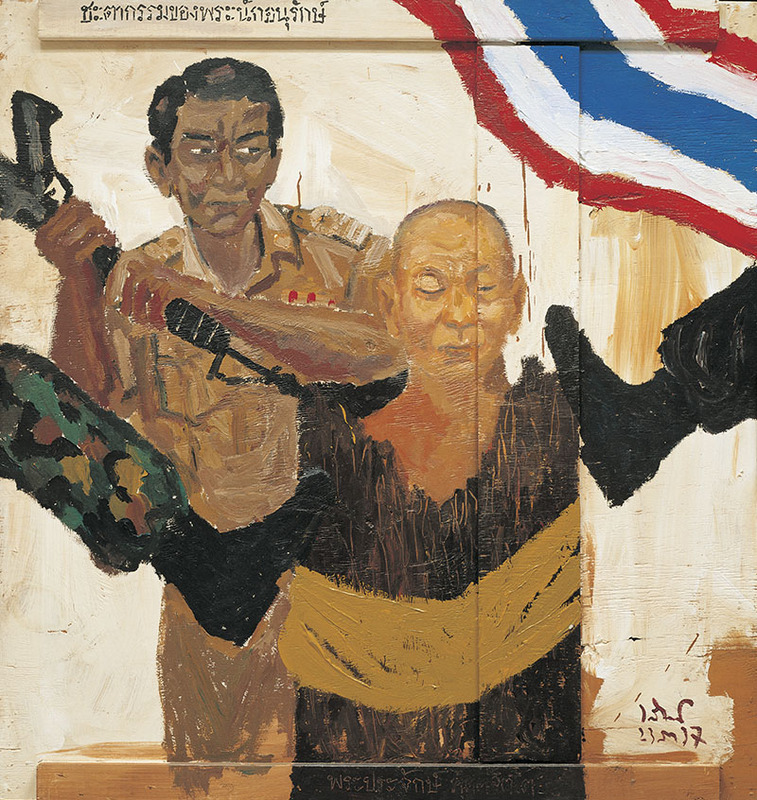 The exhibition also includes works by artists who emerged in that decade, such as Chatchai Puipia, Navin Rawanchaikul, Kamin Lertchaiprasert, and Natee Utarit, who similarly draw attention to important concerns of the period, which continue to resonate today. 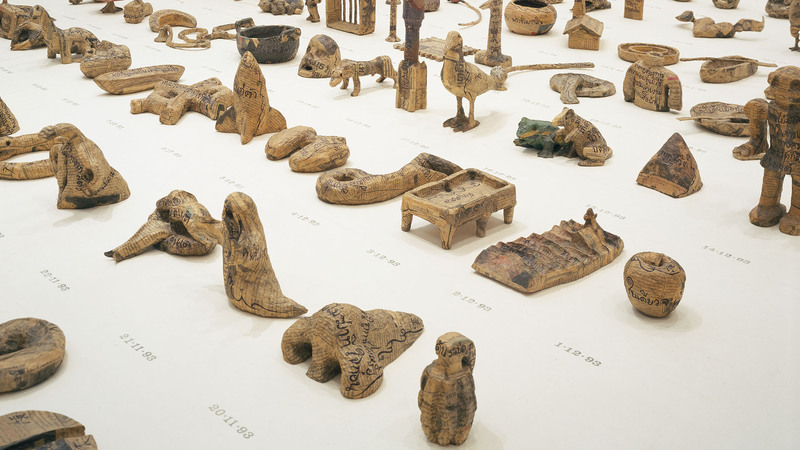 The majority of works in this exhibition were acquired during the Gallery’s flagship series, the Asia Pacific Triennial of Contemporary Art (APT). 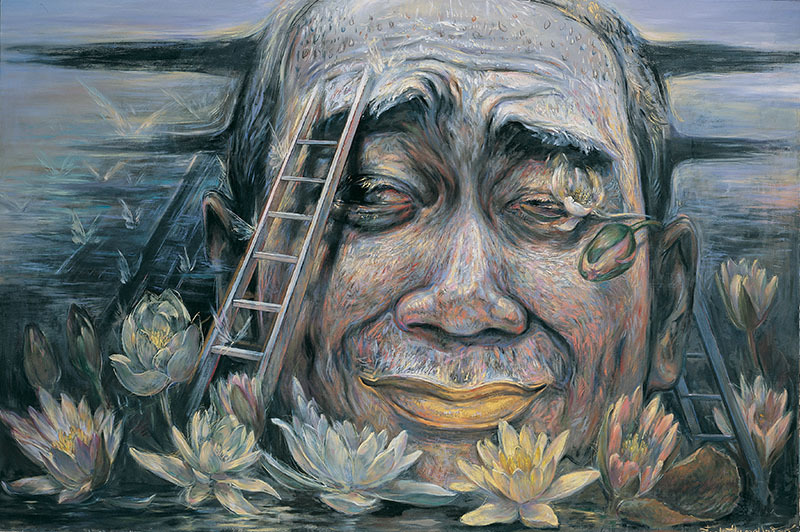 Vasan Sitthiket, Thailand b.1957 / Fate of the conservationist monk (from 'Nature is dying' series) 1994 / Synthetic polymer paint on wood / The Kenneth and Yasuko Myer Collection of Contemporary Asian Art. 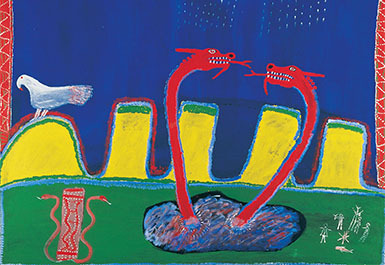 / Purchased 1994 with funds from The Myer Foundation and Michael Sidney Myer through the Queensland Art Gallery Foundation / Collection: Queensland Art Gallery / © The artist. Chatchai Puipia, Thailand b.1964 / Siamese smile: Siamese intellectual (from 'Siamese smile' series) 1995 / Oil and synthetic polymer paint on canvas / Purchased 1996. 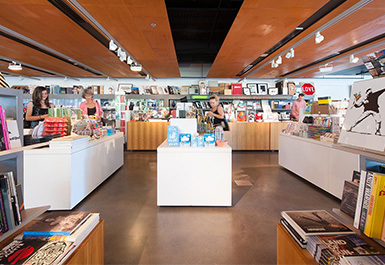 Queensland Art Gallery Foundation / Collection: Queensland Art Gallery / © The artist.